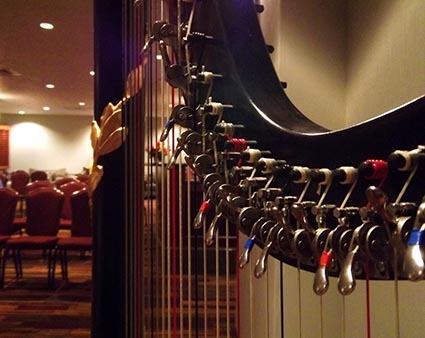 What kinds of harps do you play? My primary harp is a Venus Penti pedal harp built in Chicago in 2008. It is a concert harp, and has 46 strings. I have two lever harps (also called Celtic or Irish harps) – a BlevinSong 36-string harp built in Colorado in 2006 and a Laurel Leaf 40-string lever harp by Webster Instruments, built in Michigan in 2009. How much does your harp cost? My Venus Penti pedal harp costs over $15,000. The lever harps cost between $3,000 and $6,000. How much does a harp weigh? A pedal harp weighs between 70 and 90 pounds. Lever harps are much lighter and more portable. Each pedal is assigned a letter of the music alphabet. They are attached to rods that go up the column of the harp and attach to links in the mechanism of the harp's neck. The links move discs on the strings, giving me the ability to play sharps and flats (like the black keys on a piano). To play a C-sharp, I need to move the C pedal down into the lowest position. I can set the pedals to match the key signature at the beginning of a piece, and then move them as necessary while I play. Levers are placed at the top of each string, and are moved up to raise the pitch of that individual string by a half-step. Why are the strings different colors? The red strings are all C's, and the black strings are all F's. From those landmarks, you can determine what the white strings are. The majority of the strings are made of gut. The lowest strings are nylon wrapped in wire. How do you move the harp? I transport the harp on a piece of thick foam in the back of a minivan. The harp is covered in a specially designed padded cover, and I move it on a 6-wheeled harp cart. With this cart, I can also take the harp up and down a limited number of steps. How do you tune the harp? I use an electronic strobe tuner to tune each individual string, every time I play. The whole process takes 15-20 minutes.